When it comes to stylish high quality car styling accessories then it will hard to beat Richbrook. Not only do Richbrook offer a large range but the quality of the parts and the finish is second to none. Since 1992 Richbrook have been producing top quality performance styling accessories, helping the passionate enthusiast stamp their individual mark on their cars - thus setting it, and them, apart from the crowd. Of course, like all trendsetters they have had their imitators, but none have managed to match Richbrooks innovation or quality. It is this quality which has prompted many car manufacturers to choose Richbrook as Original Equipment and aftermarket accessory designers and suppliers. This Richbrook car styling gift set is available for a limited time only and is the perfect gift for any friend or loved one who has a car. Richbrook Black Anodised Aluminium 'twist-off back' tax disc holder. Richbrook Carbon Fibre Look Poppy Coral air freshener. Richbrook Black Anodised Aluminium anti-theft valve caps. This gift set is extremely good value for money as buying the three items separately would cost more. 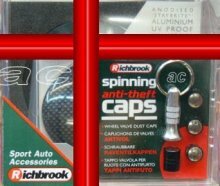 All of the car accessories in this gift pack are made by Richbrook. This Richbrook Poppy Coral Air Freshener is Universal and therefore will fit all cars. A sticky pad is included to secure the air freshener to the dashboard or any other flat surface. Can also be used in Offices, Home, Caravans. Comes complete with a Lemon Zest Cartridge. Fragrance Cartridge lasts 3 to 4 months once opened. Replacement Cartidges can be obtained once the old one runs out. 1 Carbon Fibre Look Poppy Coral Air Freshener, Size 11cm x 8cm. Bright Black Anodised Aluminium valve caps with anti-theft locking feature. 1 Set, four in a set. Simply replaces original tyre valve caps. Genuine Black Anodised Aluminium Richbrook tax disc holder. Simply fixes to windscreen using clear adhesive pads provided. Access to the tax disc area is made by twisting off the back, removing the need for complicated tools and tiny screws. 1 Black Anodised Aluminium tax disc holder. Large Selection of Richbrook Products Available in Our Store. Meguiars Hot Rims All Wheel Cleaner - All Wheel Types! !